Fact: To eat for a full year, you need 24 standard 5 gallon buckets of food. That number is based on Costco’s $1,500 year of food in buckets. Their price works out to about 4 dollars a day. To invoke a very tired cliche, that’s one latte a day! Of course, buying a pre-packaged supply of food is the expensive way to do it. If you’re willing to go through the trouble of building your own food supply, you can cut your food budget down to $0.70/day by following the DIY Food Supply plan from Off the Grid News. Back before I started using 5 gallon buckets for food storage, I had an infestation of tiny moths. They got into everything! They ruined my rice, nuts, cornmeal, barley – you name it, they ate it. 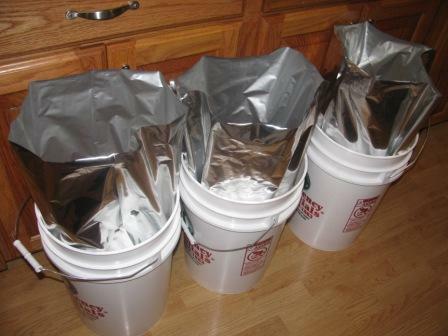 Many bucket-based food storage experts recommend using Mylar bags and oxygen absorbers to extend the shelf life of your stored foods. Unless you live in death valley, you should think about moisture absorbers as well. Moisture is an even bigger issue than oxygen, since even a tiny bit can quickly grow a little forest of mold. I have reasonable success making my own out of white rice stapled inside a paper towel or cheesecloth satchel. What Stores Well in Buckets? 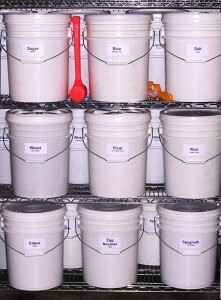 A surprising variety of foods can be stored away in buckets. The obvious candidates are dry cereal grains, legumes and nuts. Since 5 gallon buckets are impermeable, you can store liquids a fine grained foods such as oil and spices – or even water. And with a little creativity you can store whole vegetables and fruits in buckets. 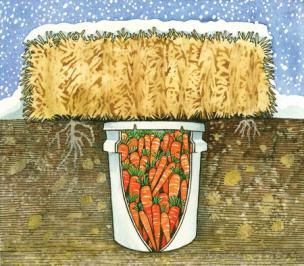 This five gallon root cellar for carrots is courtesy of Mother Earth News. In colder seasons, a 5 gallon bucket kept outside becomes a 5 gallon fridge. We’ve successfully stored apples and potatoes in 5 gallon buckets outside over the winter and spring with no problems. Since a 5 gallon bucket can be tightly sealed, they are very well protected both outdoor and indoor pests. Just watch out if you live in bear country! They won’t be slowed down too terribly much by your wimply little plastic lids. Speaking of lids, consider using a few five gallon screw-top lids for quicker, easier access when you’re eating out of your five gallon food supply. Check our Gamma Seal Lids article for all the details. 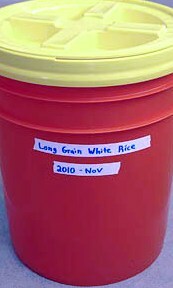 There’s a couple concepts about using your long term food storage you should keep in mind. “Store what you eat” means that your stores should contain the foods you already eat. This goes hand-in-hand with rotating your food stores by always eating your oldest food first. Rotating your food ensures that you don’t waste your food stores by letting them collect dust for a decade, losing nutritional value and getting too old to eat. Grocery stores do this when they shove their newest milk jugs to the very back. Just make sure to label each bucket with the date it was packed. Naturally, what works for people food works for animal food. 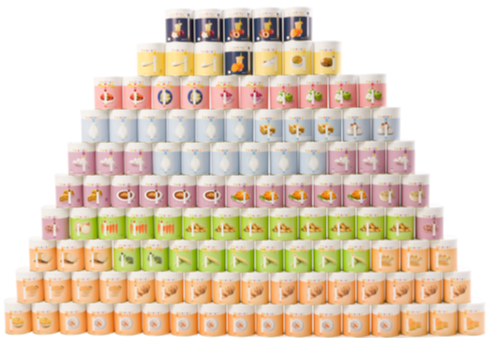 Many pet food varieties are already shipped in 5 gallon buckets. We started keeping all of our chicken feed in buckets instead of bags when rats and mice became a problem. 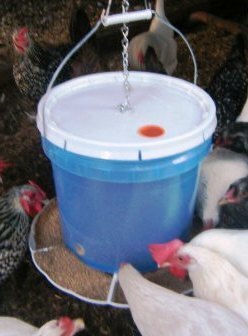 Buckets are great feeders for animals as well, check out our Chicken Feeder article for one example. Alcoholic beverages are considered food aren’t they? 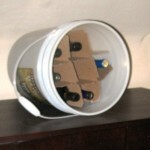 Not only can you use buckets to brew your own beer and wine, you can store your creations in them as well. I’ve found that buckets make an excellent wine cellar, and a mediocre wine rack. Those 9-pack cardboard separators that come in wine boxes actually fit great in a 5 gallon bucket. You do require those special lids for food storage though. Walmart sells food grade safe pails in their paint department. Not all 5 gallon pails are food grade. When in doubt call the manufacturer listed on the bottom of the pail like I did with the Walmart pail. No all “No. 2” pails are food grade because of the resins in the plastics. Food is expensive and it’s best to make a telephone call before wasting the food in a pail. I get my pails with lids from the bakery dept. at Wal-mart for FREE. Just ask, they are very happy to let you take them off their hands. Leaving the storage buckets in the ground is just brilliant! This is the most energy-efficient refrigerator ever. Thanks for sharing!